Carmelo Anthony has been headlining the big league for several years now, but before the superstar forward made waves in the NBA, he caught the basketball world’s attention when he played for Syracuse during his collegiate day. With Anthony’s link with the Syracuse Orange, it is not surprising that here eighth signature shoe with Jordan Brand, the Jordan Melo M8, will be release in an orange colorway, which is set to come out this Thursday, February 8. 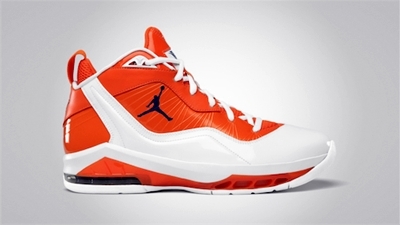 The silhouette features the combination of white and orange on the upper part accented with a navy blue Jumpman branding. Make sure to consider buying this one and you will surely get your money’s worth!